Saber and Rin are ready to cheer everyone on! The eighth product to join the Cheerful JAPAN! 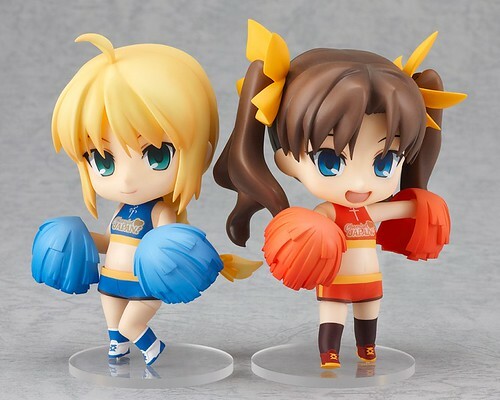 project is a set of two Nendoroids of TYPE-MOON’s popular characters – Saber and Rin Tohsaka, both wearing adorable cheerleader outfits! The Nendoroids are based on an illustration by the original illustrator of the two girls, Takashi Takeuchi – just shrunk down to adorable Nendoroid size! Both come with pompons that correspond to their image colors, as well as a flag they can both hold up together! They also come with the popular lazy expressions and extra parts that let them sit down! From the energetic cheering poses down to the tired out sitting pose after the cheering – these are two Nendoroids with a ton of fun poses to play around with! For each sale made, Good Smile Company will donate 2000JPY to aid relief efforts. This entry was posted in News and tagged cheerful japan, fate stay night, nendoroid, saber, tohsaka rin.